A Youngstown State University student is bringing the open mic night concept to Inner Circle Pizza to add more liveliness to the restaurant that many students frequent. Open mic nights take place at Inner Circle on Wednesday nights from 7:30 p.m. to 11 p.m. to give students a chance to share their passion for music and perform. 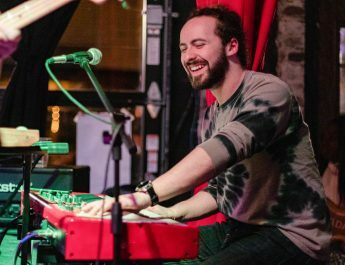 Tom Metheney, a senior business management major, is a singer and songwriter who has been performing both locally and in bigger markets for the past year. He is determined to share his love for music with the Youngstown community. Metheney said Inner Circle was one of the best spots on campus to bring his vision of an open mic night to life. Metheney said the idea to bring open mic night to campus came from his personal experiences with performing. He said there is no judgment, and as long as it was art and music, that was the point. “The concept I want people to understand once we get this going is taking the idea from the Music Mafia, which is a group of musicians from Nashville and their goal was music, and art all in one place,” he said. In Metheney’s opinion, Youngstown lacks locations that give people the opportunity to perform in a casual setting. “It’s a combination of bringing the music and students together because there’s not a place for students to do this around here,” he said. Metheney said having an open mic night gives students a place to try something new with their music or art specialty, and he wants to be encouraging about it and give students a place to perform. “The best encouragement that I can give for coming out to this is you’re never going to know if you can do it if you don’t do it and give it a shot,” he said. Shawn Crum, bartender and server at Inner Circle, said open mic night draws in a larger Wednesday night crowd. He said a lot of people come in to sing, but they also do stand-up comedy. Crum said open mic nights draw in a more creative crowd and brings positive energy into Inner Circle. “I like a lot of creative types in here because I’m an artist, so it’s good to see people come in here using creative energy,” he said. Jachob Shaffer, a junior advertising and public relations major, performed during open mic night with stand-up comedy and said he wants to keep participating in them each week.